Veterans salute the honor guard at a service for Vietnam veterans at East Tennessee Veterans Cemetery, February 5, 2019. Every year, veterans die homeless, penniless, or with no family to claim their remains. But that doesn’t mean they don’t deserve to be honored with a military burial. A national funeral services company called Dignity Memorial makes that happen. This week, local partner Berry Funeral Home held a service for seven veterans, all of whom served during the Vietnam War. 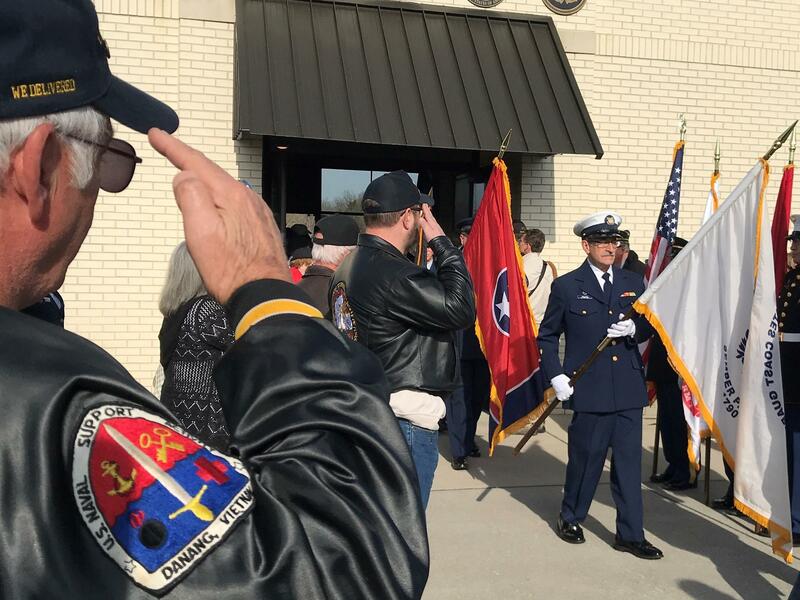 Hundreds showed up at the East Tennessee Veterans Cemetery, from veterans’ groups, to active duty service members in full uniform, to supportive locals. WUOT News contributor Heather Duncan went to this week's service. This what she heard. Sergeant Wilson, born August 22, 1941, enlisted in the United States Army in November 1969 and served thirteen years and five months with Company B, 2/34th Infantry Battalion FORSCOM FC. Frank entered service from New Orleans, Louisiana. He was a Vietnam veteran and was a recipient of the Army Service Ribbon, Overseas Service Ribbon with Numeral 2, Good Conduct Medal (4th Award), Third Class (Hand Grenade), National Defense Service Medal, Vietnam Service Medal, Vietnamese Cross of Gallantry with Palm (Unit) Combat Infantryman Badge, Republic of Vietnam Campaign Medal, Army Commendation Medal, Bronze Star Medal and Overseas Service Bars with Numeral 2. Mr. Wilson died August 3, 2018 with no one to claim him. Specialist 5th Class (T) Burnett, born November 20, 1946 in Detroit, Michigan, was inducted in the United States Army on April 25, 1968. He served with the 55th Aviation Company, Eighth Army. He was honorably discharged December 27, 1969. He was the recipient of the National Defense Service Medal, Good Conduct Medal, Armed Forced Expeditionary Medal and M14 Marksman.Sp5 Burnett died October 16, 2018 with no one to claim him. His wife, Angela Marie Burnett, was born February 12, 1946, and died in May, 2017. She will be interred with him. Specialist 4th Class Ellis, born July 28, 1943 in Knoxville, Tennesse,e died July 23, 2018 with no one to claim him. He served in the United States Army from March 16, 1967 to October 26, 1968 with Battery C 6/37 Arty 2nd Infantry Division. He served over one year on foreign soil with the U.S. Army Pacific Command. Specialist 4th Class Lundy was born February 4, 1955 in Knoxville, Tennessee, and raised in the Gibbs Community. He attended Gibbs High School and enlisted in the United States Army February 26, 1973 from his home in Knoxville. He served for three years and was honorably discharged on February 25, 1976 in Oakland, California. He was with Company A, United States Army Support Command, Hawaii, United States Army Forces Command. He was the recipient of the National Defense Service Medal and was a Motor Transportation Operator in Hawaii. Specialist 4th Class Cunningham, born January 25, 1950 in Waynesburg, Pennsylvania, entered the United States Army September 24, 1970 in Pittsburgh. He served in the Army for three years and was discharged September 17, 1973 at Fort Dix, New Jersey. He was the recipient of the National Defense Service Medal, Expert Grenade and Sharpshooter M16. Stephen died December 27, 2018 with no one to claim him. Private First Class Farrar, born August 1, 1947 in Gary, Indiana, died October 2, 2018 with no one to claim him Pfc. Farrar served in the United States Army with the 523rd Engr. Co. USARPAC from November 15, 1966 to November 3, 1968. He was the recipient of the National Defense Service Medal, Vietnam Service Medal and the Vietnam Campaign Medal. Seaman Apprentice Baker was born March 23, 1948 in Barbourville, Kentucky. He entered the United States Navy on March 23, 1965 in Knoxville, and was discharged at the Naval Station in Philadelphia, Pennsylvania on March 9, 1966. During his eleven months in the Navy he was assigned to the USS Springfield (CLG-7).